Welcome to 2018! If you are like many facility managers or warehouse owners, you are always looking for ways to improve your warehouse or storage areas. The start of a new year is the perfect time to make improvements to your warehouse and to create a safe, efficient, and productive work environment. If you are looking for inspiration for how to make improvements to your warehouse for 2018, here are some great New Year’s Resolutions to get you started. There is nothing that will cost your warehouse time, money, and productivity like worker injuries and accidents. Fortunately, reducing injury and accidents in your warehouse can be easy with a good safety program. What does this entail? First, start by making sure that your employees are well trained on the operations of your warehouse and the equipment they are using. Many employee injuries are easily avoidable with good training on the processes and equipment. Then, make sure your employees have the equipment they need to work comfortably and safely. This may include things like providing proper personal protective equipment (PPE), giving employees places to warm up if the weather is cold, and providing safe spaces for doing paperwork or eating. OSHA inspections of warehouses can be problematic for your operations. Make sure that your warehouse is ready for any inspection by ensuring that your processes and employees are OSHA compliant. Providing OSHA-required training to your employees is an easy way to get a jump on being OSHA compliant. 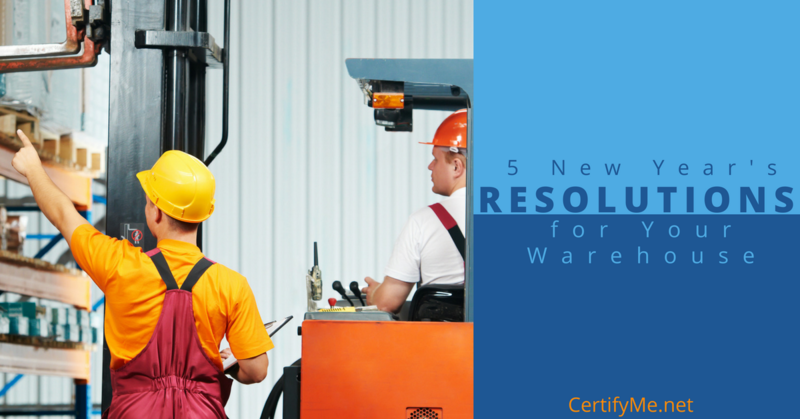 This is especially important for the warehouse that uses aerial lifts, forklifts, and pallet jacks. The benefits of providing OSHA required training are twofold: you meet the requirements that keep your warehouse up and running, and you have a safer workforce. Both of these benefits will help your bottom line, by keeping accidents and downtime to a minimum. There is a theory that for every minute you spend getting organized, you earn an hour of productivity. Very few warehouse and facility managers would disagree that more productivity is better for their company’s bottom line. When your warehouse is poorly organized or is not laid out in a logical manner, it can slow down production, create traffic flow problems, and slow down productivity in general. If you’ve noticed that your warehouse can use some improvements in how it’s laid out, how product is stored, or how your shelving is organized in regards to traffic flow, 2018 is a great time to make changes. For many warehouses, the beginning of the year is a slow, quiet time. Why not take advantage of a slow season and make organizational changes to the layout of your warehouse? Believe it or not, but while new technology can be expensive, it can make a substantial improvement in the way your warehouse operates. If you are using outdated automation equipment or software that has been around for more than five years, chances are your productivity isn’t at the level it could be. Making an investment in new automation equipment or a software upgrade can also save time and money when it comes to how long it takes to produce or ship a product. You can also better manage orders and track supplies with improved warehouse management software. This saves time for your employees and reduces problems related to lost or delayed orders. Happy employees are productive employees. Many facility or warehouse managers automatically think this means that they have to pay their employees more. However, this isn’t always the case. Many times, giving employees a small incentive to grow and improve is all it takes to keep employees happy and productive. Incentive programs should provide a good challenge to employees, that will help them grow and become better employees but shouldn’t be so challenging that even your best employees cannot be successful. Your new incentive program doesn’t have to cost a lot of money or require a party every time something good happens. It should, however, reward the work features that are important to your warehouse, like speed, productivity, efficiency, accuracy, and safety. This is just a start of the resolutions that you can make for 2018. For you, the warehouse or facility manager, the start of a new year is a great time to begin making your workplace the best it can possibly be. By improving the way your warehouse runs through better organization and upgraded technology, you increase productivity and reduce slowdowns caused by an inefficient workplace. Improving the safety, productivity, and motivation of your employee makes the changes to organization and technology even more useful for your company. Happy and safe employees will work harder, be reliable team members and may even stay with your company longer. Look into the online, OSHA-compliant equipment training from CertifyMe.net to make 2018 your safest and most cost-efficient year yet!